Probably one of the MOST common questions I get asked in all of my events is the big “how much”. At the end of the day it’s a logical question and the simple answer is this. In my personal opinion – in today’s market – the minimum household income one needs to invest in property is $80,000. Now let’s look into this figure with a little more detail. You might be aware that 5+ years ago, the Royal Commission forced the banks to pull their socks up when it came to the amount they were lending out to customers. There were scary amounts of cases where people were borrowing far more than they should have and they couldn’t meet their repayments. Homes were being lost. Family stress was through the roof and in many of the cases – the customer should never have been allowed to borrow in the first place. Now it’s harder (rightly so) and banks are starting to have more stringent policies in place that ensure you can afford your loan without impacting your lifestyle. In turns this means that the minimum household income to get started is (safely) in my opinion at the $80,000 mark. Remember – we’re talking about combined income here. So, it’s very doable for the average family. You can split the percentage of ownership of the property between the borrowers so the higher the income earner = the more they own = the more they can deduct, thus reducing their taxable income. Your future cashflow is taken into consideration before any loans are taken out to ensure it is not going to impact you and your cashflow in a stressful way. 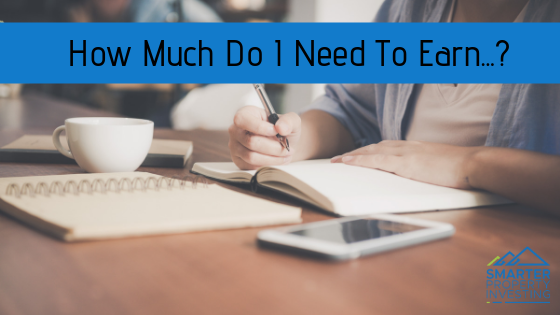 If you’re still worried that your income is not enough (or that you’re possibly stretched too thin already) – why not work on saving some money first. Grab a copy of my free eBook “50 Free Ways To Save Money” here. BUT if you’re realising that investing in property might not be so far out of your dream as you anticipated, let’s make a time to chat so I can answer any other questions you might have about your personal situation and goals. Give me a call on 1300 736 754 or send me an email here.